LXFactory. Imagine an old factory ground. Imagine that it was abandoned for years. And finally imagine a group of creative people that decided to make this place their own with restaurants, stores and art all over. 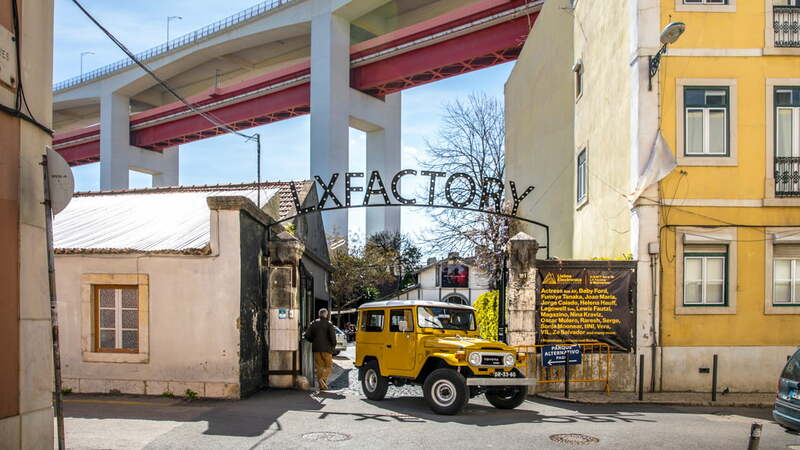 Welcome to the LX Factory – You will love it! Even if this place is more than an art center, that is still the main thing that you will see while walking around here. My personal favorite was the honeybee on the wall. Artwork made by Bordalo where he uses trash to create miracles. You can see more of his artwork around Lisbon but you need to see this honeybee. Make sure to really look around while visiting. The artwork is all over and some of it might be easy to miss. Once you enter the area of the LXFactory it’s like walking into a brand new world where everything is possible and where anything can happen. Lisbon has some great shopping. If you are looking for something different – LXFactory is the place to be. The shops that you will find here are unique. You want to spend your money here! I have a “fetish” for world maps. At the Bairro Art store, you can buy maps in all shapes and sizes. Get a chalkboard world map or why not a paper globe? Since we live full time in a motorhome, we can’t buy all the stuff we want. And since we already have a world map made out of cork we didn’t buy anything here. However, I could have spent a lot of money here if Mini would let me. I ended up buying a dress in another store. It is long and I love it! Whatever you are looking for – this is the best place to buy crazy and unordinary things. Oh, how I love this store! Everything here is fun and different. How about a tea infuser that is called “teatanic”, how awesome is that? Or what about a huge clock that is so big that it is a piece of art by itself? This store is quite big and they have things all over. I think that we spent a good 30 minutes here, just looking at all the cool stuff. This is truly a must while visiting the LXFactory! Address: R. Rodrigues de Faria 103 R/C, 1300, Lisbon. Shop at the concept store Be…! Since all the stores here are really unique and different – you will love all of them! However, there was one store that was a bit cooler than the rest of them. It was not for the things they were selling but for the way the store operates. While we were there the store was Be Fun! Every few weeks they will change all of the store’s inventory and change the name. Since it was Be Fun, they were selling different things that were fun! I found the exact same grater that we have – and yes it is very fun! Make sure to visit this place and please… let us know what the store was called during your visit! Address: 103, Edifício L, R. Rodrigues de Faria, 1300 Lisboa. Inside the LXFactory they also have the coolest bookstore ever! The store is on two floors and they have huge printers inside. The printers are not in use but they fit perfectly in the environment. There are books from the floor to ceiling and it is just an awesome place to visit. If you want you can grab a book and just sit down and read. Come to think of it – this place is a library and a bookstore all in one. The name of the store is Ler Devagar. Make sure to check it out! Address: Rua Rodrigues Faria,n. 103-Ed.G – 0,3, 1300 – 501 Lisbon. Opening hours: Monday: 12.00 – 21.00. Tuesday to Thursday: 12.00 – 00.00. Friday and Saturday: 12.00 – 02.00. Sunday: 11.00 – 21.00. Like the shops, there are no ordinary restaurants here. We ended up getting our lunch at a Mexican place that had some amazing, different menu. This is not your typical Mexican hangout where you eat tacos or nachos. Sure you can get that here but it will be with a different touch. The whole place is decorated like a fighting scene. There is a rink in the middle and the walls have different masks. I think that it might be for wrestling?! The rink in the restaurant also has a table where you can sit. We ordered the Cangrejo picante con salsa de chile guajillo. Translated into English that is Fried soft shell crab on avocado quinotto with guajillo chili reduction. Honestly… I don’t know what all of that was but it was really good. Once we got our meal we had to ask how we were supposed to eat the crab. At first, we wanted to take it out of the shell but it turned out that since it is soft shell – you are supposed to eat the shell to! I had a glass of wine and Mini had a beer. We shared the one dish and the bill ended up at 17,60:- euro. We had a great time here and this place is well worth to visit! Since we were enjoying LXFactory so much we ended up having our dinner here to. But this time we tried a different restaurant – we went to A Praca. Mini got his beer in the coolest glass ever! I fell in love with the lamps that they had here because they were so different and so fun to look at! I ordered a Factory Burger (10 euros) with grilled goat cheese and red onion jam. Mini got the Mushroom Tagliatelle with Parisian mushrooms, porcini mushrooms and parmesan cheese (12 euro). We ended up spending 33 euros here but that was with a glass of vine and a huge beer. To sum it up! LXFactory is the place where all crazy have been placed in one area and it is great! This is the place where locals and tourists meet and are all friends!